The Helpful Engineer visited the new official motorway service station/ rest area on the M4 this week. It opened at Enfield, Co. Kildare, (50km West of Dublin), at the beginning of this month. It is the final one of three which have opened during the last four weeks, at a total cost of €70 million, (for all three). The other two sites are on the M1 motorway. 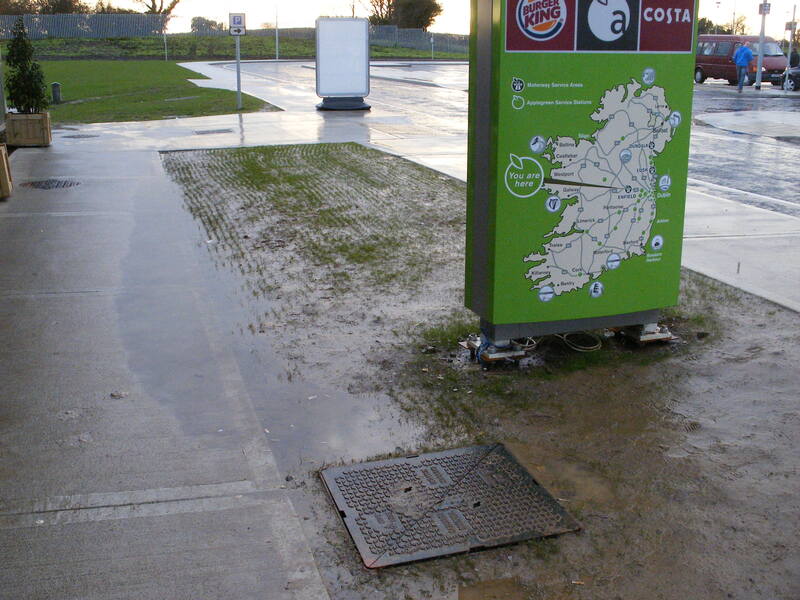 These service station areas are badly needed as at present there is approximately 1000km of high standard motorway in the Republic of Ireland but only three official service/ rest areas. The National Roads Authority initially decided against service areas when planning the network but after a public outcry have since changed their decision. This is good, as it defeats the purpose of a motorway if motorists have to leave it to search an unfamiliar town, looking for a toilet or petrol station. The new M4 service station complex is impressive and compares well with the best available in France, Austria or the UK, (the EU countries that I am familiar with). 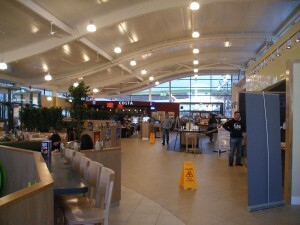 The M4 Service Area consists of two separate stops, one on either side of the motorway. They are not linked by access across the motorway and are therefore standalone complexes. Services are provided for both hauliers and private motorists. Located in both sites are a fast food outlet, a café, a self service restaurant and a convenience store. The facilities include lots of separated parking for HGVs, cars, motorbikes and coaches, along with shower facilities, toilets and even protected outdoor and indoor play areas for children. 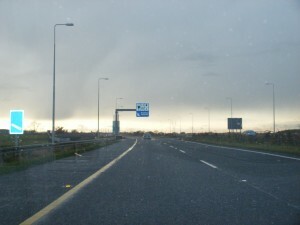 It is well sign posted with current fuel prices displayed on motorway signs approaching the turn off. All the outlets are contained in one large open plan building which has high ceilings and is very bright, inviting and clean. Noise levels were low; although there were few children present and it wasn’t that busy. 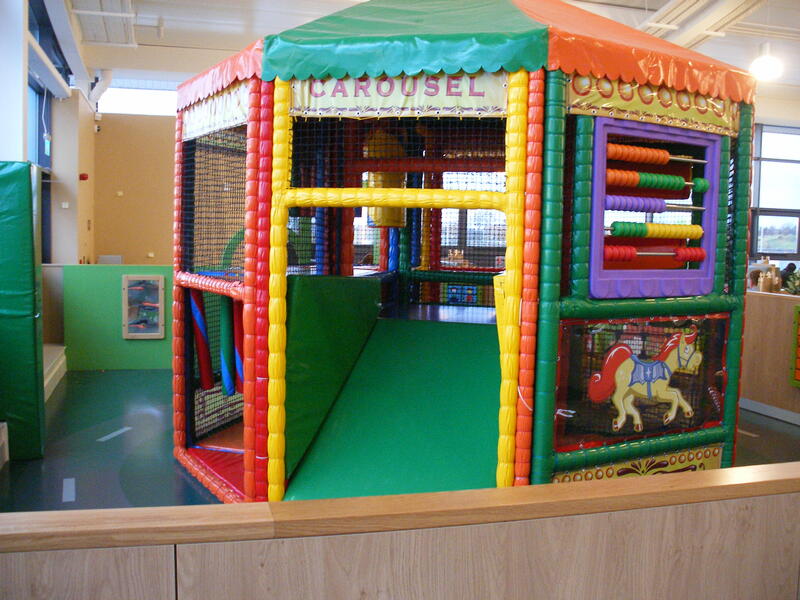 Indoor and outdoor play areas present to let the children use up some energy on long drives. There was no large safe outside picnic area, similar to those in French service areas, where you have enough space to kick a ball around, walk a dog etc. 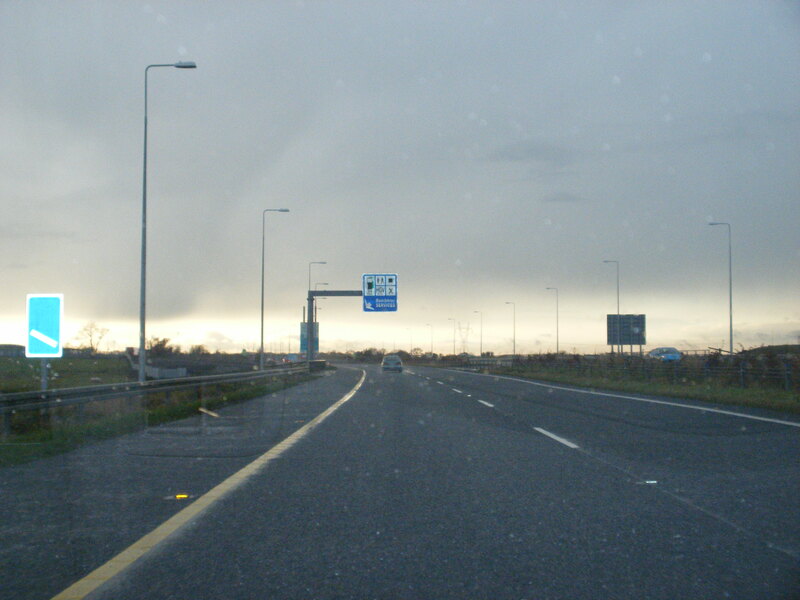 It is located quite close to Dublin and motorists traveling between Galway and Dublin City centers may not bother to use it as they will be close to their destination/ origin. The centre is still being snagged at the moment as yellow ‘post its’ were stuck to the walls in the toilets indicating minors defects which need to be rectified, for example one note said ‘seal joint between tiles and unit with mastic’. The pathway outside the complex access door which leads to the main carpark requires drainage gullies as there was much ponding water, see photograph, although we didn’t see a ‘post it’ note about the drainage problem! Service Stations used to be dodgy places to stop and rest and get good food. 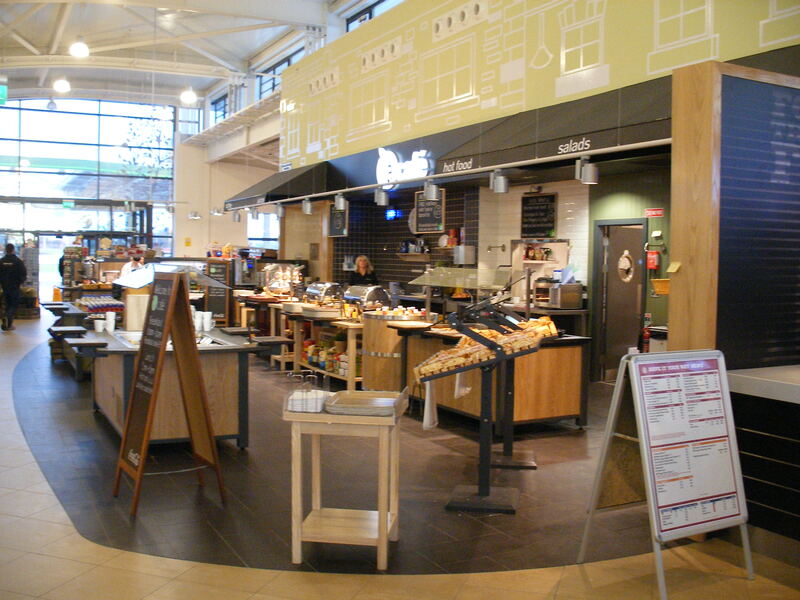 But lately a lot of them have been taken over by the likes of Waitrose, M&S, Tesco and they seem to be run well, clean, tidy, modern with decent cafes and shops. 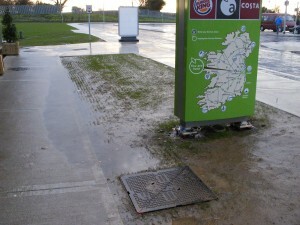 Wow, Ireland opens first Service Station. No more driving into dodgy backward villages looking for a decent pub for a pee and food then. Using the same notation as the UK makes it confusing. When you mention the M1, M3, M4, M20, M40, M25, we all know what they are and where they go. Out from London. They really should’ve named the Irish Motorways IM1, IM50, I’m 4 etc., There will be disputes whether the M4 goes to Swansea or Sligo?